Oakland, NJ – Labeling Systems, powered by Pro Mach, will be demonstrating a broad range of the latest pressure sensitive labeling technology at Pack Expo International, October 28-31, in Chicago’s McCormick Place. Featured products include LSI’s Model 1220 Track and Trace Bundle Label System, which helps manufacturers follow their products through the supply chain by carrying forward handling data at each stage of transport. The primary reason for track and trace systems is to protect consumers from contaminated or counterfeit products, such as food, medicine, and other goods. It also helps manufacturers reduce costs related to product lost or recalls because it allows them to serialize and track at the unit level. The Model 1220 Track and Trace Bundle Labeler aggregates units into bundles through a vision based system, simultaneously reads codes on all unit cartons in the bundles, prints and applies a bundle label, then inspects, and if necessary, rejects bundles that aren’t labeled or aggregated properly. The Model 401 Color Print and Apply Bottle Wrap Labeler: The Model 401 is a full color, print and apply tabletop bottle wrap labeler. The semi-automatic system uses a Quick Label Systems QLS 4100Xe thermal transfer printer, in a loose loop arrangement and is ideal for small volume manufacturers that require full color bottle labeling. The Model 1200 Tack and Wrap Square Bottle Labeler: The Series 1200 is specifically designed for side labeling of products such as square or rectangular boxes, bottles, F-Style bottles, buckets, spray bottles, cylindrical bottles or cans. It provides print engine-based loose loop lot and date code printing and vision-based inspection. The Model 1500 Wrap Labeler: The 1500 series is designed for labeling straight sided cylindrical products either filled and capped or empty. The Series 1500 wrap labeling system works with any of LSI's standard labeling heads and offers Stainless Steel Open Frame Construction, Allen Bradley Control Package, Lot and Date Code Printing, and Vision based print inspection. The Model 301 Syringe Labeler: The Model 301 is a custom, semi-automatic solution for applying Needle Trap labels to syringes. The Model 301 works with any of LSI’s standard labeling heads and is available in multiple custom configurations. The Model 4570 Horizontal Starwheel Vial Labeler: The Model 4570 is a fully integrated labeling system for vials using a horizontal starwheel. It is capable of labeling filled, capped, or empty products and is available in multiple custom configurations. 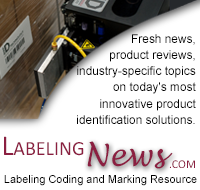 For more information on Labeling System products call (888) 405-4574 or (201) 405-076 or visit www.LabelingSystems.com. Labeling Systems is a brand of ID Technology a leading single source provider of labeling, coding and marking equipment, service and supplies. Our focus on manufacturing combined with our philosophy of improving upon our past successes ensures LSI's continued growth through the 21st century. ID Technology is powered by Pro Mach, a Cincinnati, Ohio based provider of integrated packaging and processing products and solutions for food, beverage, consumer goods, pharmaceutical, and other diverse companies. Through multiple brands, Pro Mach provides product packaging and processing equipment, PMMI certified training, installation, parts, and service in Bottling & Capping, Primary Packaging, Flexible Packaging, Material Handling, Identification & Tracking, and End of Line Packaging. For more information about Pro Mach visit prev.promachinc.com. LSI offers a broad range of pressure sensitive labeling solutions designed to meet the demands of a 24/7 production line. Copyright© 2019 Labeling Systems, LLC.